Special Containment Procedures: When not under experimentation, SCP-350 should be contained within a locked storage unit. No personnel other than those undergoing experimentation with SCP-350 should be allowed to sign SCP-350, no matter what might be offered in exchange. Those who have signed SCP-350 should be allowed to fulfill the terms of SCP-350 until the terms conflict with Foundation interests, at which point they should be restrained or terminated as necessary. Any Staff Member above Level 3 caught signing SCP-350 for any reason must be immediately terminated. Description: SCP-350 appears to be a single page contract followed by 49 blank sheets. The contract outlines a basic exchange of a good or service in exchange for a small amount of money wired to a numbered account at ██████ Bank in Zurich, Switzerland. The wording of SCP-350 is different to every reader prior to signature, and the good or service offered is always to be something the subject has expressed great desire to obtain. The document is also always in the native language of the reader, and conforms to the laws of the nation in which the subject makes their primary residence. Attempts to use video or photography to get an objective image of SCP-350 at this stage have failed, as the text continues to vary from person to person. 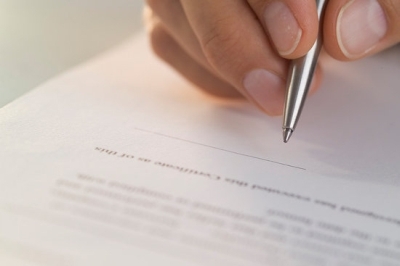 Upon signing of SCP-350, the variable language property of the contract ceases and the text of the contract stays in the language of the owner of the signature on the document to all readers. The subject will invariably find the object or a proof of service shortly after exiting SCP-350's containment unit, always in a location without direct surveillance. Should the signatory of SCP-350 fulfill the terms of the contract and wire the money to the bank account, SCP-350 begins to add new amendments and terms starting from the second page, most of which demand a minor service of some form from the signatory. However, the complexity of the terms and demands increases with the number of amendments fulfilled, eventually reaching extremes including but not limited to: the murder of staff members, the removal of SCP-350 from Foundation containment, and even [DATA EXPUNGED]. Should the signatory not fulfill the original or new terms of SCP-350 for any reason for a full week, they will begin to feel a noticeable urge to complete the current task. This grows into a compulsion on the order of the 'tics' of those suffering from severe obsessive compulsive disorder. Should the subject be prevented from completing the terms at this point, the subject will begin to lie, steal, kill, and take other extreme actions to attempt to fulfill the demands of the contract. Psychological analysis at this point reveals nothing, as the subject is utterly fixated on completing the task, to the exclusion of all else. If the subject is restrained from completing the task, the subject will resort to constant escape attempts, refusing to eat, drink, or sleep. Subjects will die unless placed on intravenous fluids and forced into a chemically-induced coma. At this point, their metabolism and bodily functions will begin to speed up until the subject dies from either a heart attack or the inability of intravenous therapy equipment to keep up with the metabolism.